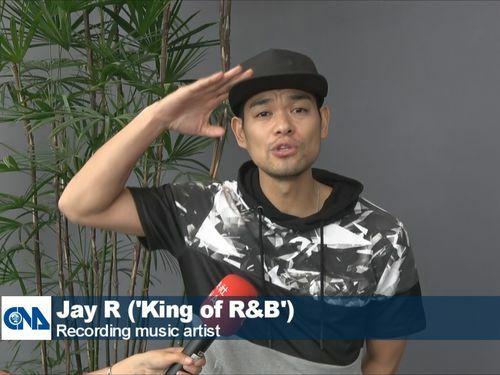 Taipei, April 14 (CNA) The celebrated Philippine "King of R&B" Jay R saluted Filipino migrant workers around the world for their hard work and dedication to their families and country after arriving in Taiwan on Saturday for a singing competition the next day. "I want to say you guys are making our economy stronger by going outside of the country and working and earning different currencies to bring to the Philippines," the multi-album artist said in an interview with CNA, referring to Filipino migrant workers. "I just want to say salute to you and thank you so much for the dedication for your country." Philippine "King of R&B" Jay R salutes Filipino migrant workers around the world for their hard work and dedication on Saturday at Taiwan Taoyuan International Airport. Jay R arrived in Taiwan on Saturday morning to be a special guest at the Taiwan qualifier of the MOR 101.9 Global Pop Icon, a singing competition for Filipinos being held for the first time by Philippine radio station MOR 101.9. 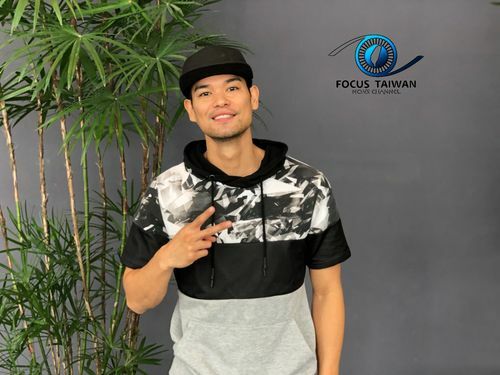 Ahwel Paz, MOR 101.9 Global Pop Icon proponent and overall director, said the competition has been held around the world using another branding for the past nine years, but it is coming to Taiwan for the first time this year. MOR 101.9 Manila Global Pop Icon overall director Ahwel Paz (left), hosts Rico Romantico (second left) and Ana Ramsey (second right), special guests King of R&B Jay R (center) and Klarisse De Guzman (right) pose for a photo on Saturday morning at Taiwan Taoyuan International Airport. "We are making history actually among the Filipino community here in Taiwan," he said. The Taiwan event will be held in Taichung on Sunday, and Jay R was happy to have the chance to perform here for the first time. "You know there are so many talented Filipinos all around the world and we heard there's a bunch here in Taiwan. That's why we wanted to come here and spread joy and inspiration to all the up and coming singers and performers here," he said. When asked what songs he'll perform at the event, Jay R said he would like to perform his original songs, such as the classic Bakit Pa Ba, a new song that came out last month called Kamusta Ka, and a few songs from his favorite artists. On what advice he would give to Sunday's contestants, he said, "it's all about preparation, it's all about practice. If you go on stage without preparation for sure it's not going to be successful, so it's all about hours of rehearsal and practice. "It's about the mindset. You really need to (be) ready for this, focused on it, if you really want to be an entertainer, you go for it, follow your dreams, you can do it," Jay R said. Paz was pleased to be bringing some joy and comfort to Taiwan's Filipino community. "I know how Filipinos abroad, especially in Taiwan, miss their families back home and also miss the Philippines, he said. "If they cannot come home to the Philippines, we bring the Philippines closer to them." Sunday's competition will be for Filipinos either working or living in Taiwan, and the winner will have a chance at the grand prize. 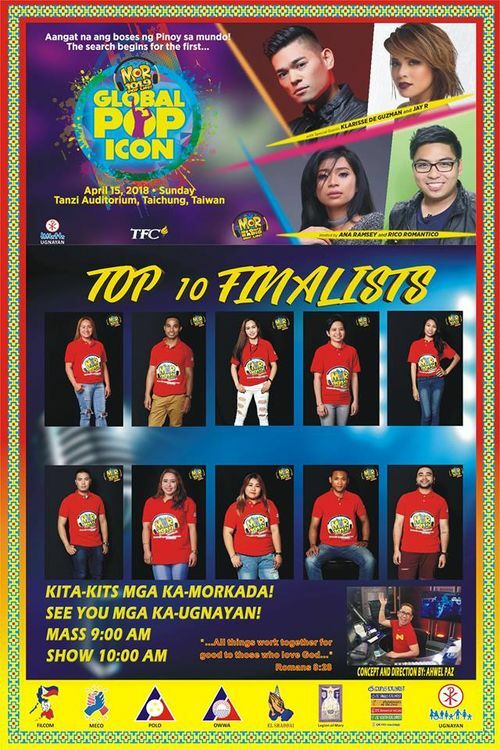 "There will be 10 finalists, one of which will emerge as the winner and represent Taiwan in the grand final in the Philippines competing with representatives from other countries," Paz said. Whoever emerges as the grand final winner will be awarded with a recording contract with MOR 101.9 and record company Star Music, Paz said. Celebrated singer Klarisse De Guzman will also be a special guest along with Jay R at Sunday's event. "It's my first time to be here in Taiwan and I'm so excited to perform for all the Filipinos here," she said. "It's time for us to give back and perform for all of you," she said. Other celebrities participating in the event will be hosts Rico Romantico and Ana Ramsey, who also arrived in Taiwan on Saturday. For Jay R, the competition could have a more far-reaching impact if it brings the musical communities of Taiwan and the Philippines closer together. He believed that Taiwan, with its state-of-the-art equipment and recording facilities, and the Philippines can work with each other to form a deeper musical partnership capable of elevating the music industry. "You know there is J-pop and K-pop going around the world. Taiwan and the Philippines can do the same thing," Jay R said.